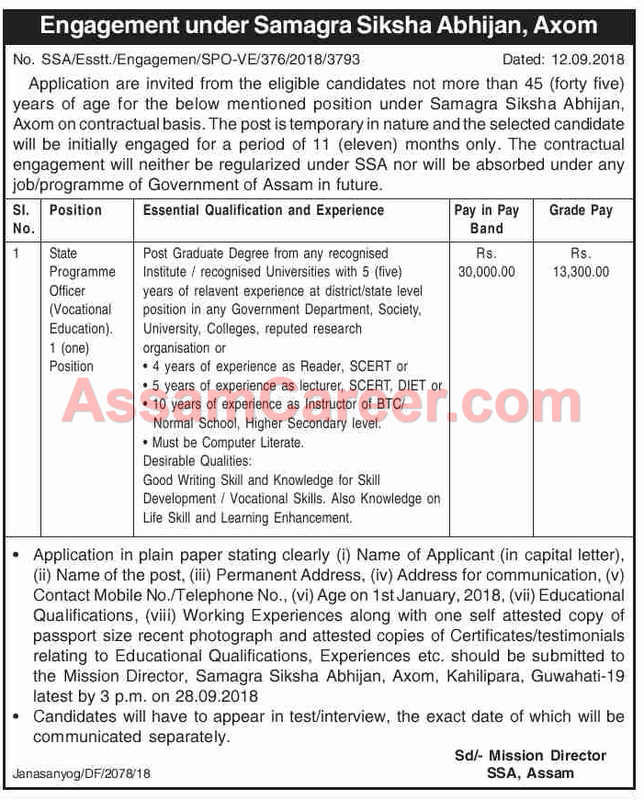 Application are invited from the eligible candidates not more than 45 (forty five) years of age for the below mentioned position under Samagra Siksha Abhijan, Axom on contractual basis. The post is temporary in nature and the selected candidate will be initially engaged for a period of 11 (eleven) months only. The contractual engagement will neither be regularized under SSA nor will be absorbed under any job/ programme of Government of Assam in future. Desirable Qualities: Good Writing Skill and Knowledge for Skill Development / Vocational Skills. Also Knowledge on Life Skill and Learning Enhancement. How to apply: Application in plain paper stating clearly (i) Name of Applicant (in capital letter), (ii) Name of the post, (iii) Permanent Address, (iv) Address for communication, (v) Contact Mobile No./Telephone No., (vi) Age on 1st January, 2018, (vii) Educational Qualifications, (viii) Working Experiences along with one self attested copy of passport size recent photograph and attested copies of Certificates/testimonials relating to Educational Qualifications, Experiences etc. should be submitted to the Mission Director, Samagra Siksha Abhijan, Axom, Kahilipara, Guwahati-19 latest by 3 p.m. on 28.09.2018.